The cycle Still/s is more usefully thought about in terms of the visual rather than the musical. Indeed it was from a collaboration with a visual artist that the idea for the cycle first emerged: in 2002 the De La Warr Pavilion, Bexhill commissioned the British painter Joan Key and myself to devise a project in which a group of six paintings and a piece for solo cello were to be derived from a single, shared process of gestation. It was decided to start with a deliberately rule-driven procedure involving the placing of six “music notation” canvasses into various “still life” arrangements (see photos), the distances between “notes” being recorded and later used as a compositional blueprint, the canvasses also being independently worked into their final incarnation at a later stage. Key’s Six White Paintings for Composition were ultimately exhibited as part of the ‘Colour White’ exhibition at the De La Warr Pavilion in July 2002 during which the cellist Anton Lukoszevieze gave a solo recital including my part of the collaboration, Still/s 1. Eager to continue a close exploration of the seam of material exposed by the project, I decided that the cello piece would be the first of 24 pieces composed for all the solo, duo and trio combinations of a 5-instrument ensemble, the idea of combinations being particularly germane to the project. Still/s 22 for clarinet and piano was completed in late 2002 and premiered by Carl Rosman and Mark Knoop, Still/s 14 for solo violin was commissioned and first performed by Darragh Morgan in June 2003, Kathleen Gallagher and Knoop premiered Still/s 10 for flute and piano in March 2005 and Anton Lukoszevieze has meanwhile given further performances of Still/s 1, including one in association with an exhibition by Swiss constructivist artist Richard Lohse at Haus Konstruktiv in Zürich. Performers of future pieces include the New York Miniaturist Ensemble. Tonight’s performance is the first concert-length grouping, nos. 4 – 6 having been specially commissioned for the occasion with funds provided by The Britten-Pears Foundation. Albrecht Dürer apparently reported that he liked the fact that no two impressions of one of his engravings on copperplate were alike. This idea of the inexhaustible, and often qualitatively different, possibilities (“combinations”) derivable from a limited quantum of material is, as suggested above, central to the poetry of the cycle – openness and possibility as opposed to closedness and the definitive. The De La Warr Pavilion itself is a famous emblem of Modernism, and the materials of my cycle have something of the bare, almost “white cell” feel of much Modernist architecture. They are extremely pared down, in an attempt to draw the listener in to a quiet focussing on minutiae of detail, to “still” in the contemplative sense. This material is often presented between extended silences, as if in quotation marks – it is there not to participate in some ongoing rhetoric, but in the spirit of non-action, a concept found in many Eastern philosophical traditions. One such tradition is Daoism, one of whose many aphorisms refers to the ability of the enlightened individual to sense the innate life-span of every living thing. This is relevant to what is perhaps the cycle’s central concern: to endow each sound with its own innate span, or, it might be said, its own duration, or tread, its own breadth, or breath. There is also an attempt to arrive at a kind of naturalness, or “rightness”, for the pulsations, which frequently coalesce in two’s, oscillating with delicate randomness. 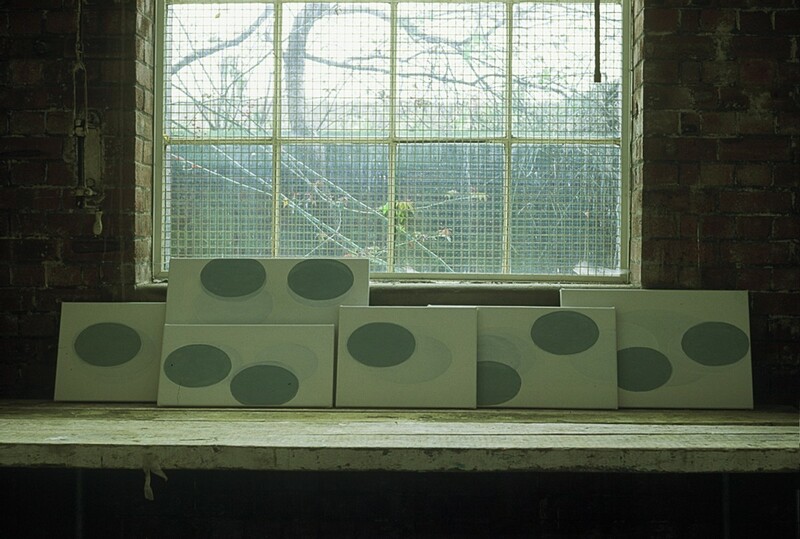 Central to the original concept of the collaboration with Joan Key was that the six canvasses used in the process of gestation were to be steadily whitened out with each new “still life” arrangement. The canvasses’ notations became “absent” – agents no longer present, but perhaps subtly detectable as a trace. To return to the subject of Modernists, the work of Samuel Beckett was once described as embodying a process which moved steadily towards “whiteness, absence, stillness and silence”.